William was originally buried in the Old Hamilton Burying Ground, Hamilton, Butler Co, OH. [S3] Hamilton County, Ohio Will Book, Vol. 1, 472. [S4] McBride's Pioneer Biography, Vol. II, James McBride of Hamilton, (Robert Clarke & Co., Cincinnati, 1871), Dar CT254 M11 v.2., 9. See entire "Pioneer Biography" excerpt: pages 7-98. [S4] McBride's Pioneer Biography, Vol. II, James McBride of Hamilton, (Robert Clarke & Co., Cincinnati, 1871), Dar CT254 M11 v.2., 97. [S1] A History & Biographical Cyclopaedia of Butler County, Ohio - Evansville, Ind. 1882, 574a, Union Twp. James Patchell, the son, was born on the 9th of July, 1814, at Oil Creek, Venango Co., Penn., and remove with his parents to Clermont Co., in Ohio, in 1816. He came to Union Twp. in 1830. On the 28th of Aug., 1842, he was married, at Port Union, to Mrs. Belinda McClellan Smith, widow of Dr. G. M. Smith. 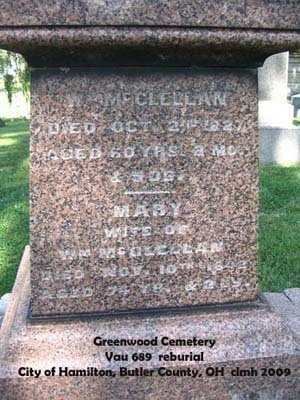 Her maiden name was McClellan, being the daughter of James McClellan and Anna Giffin, and she was born in Hamilton Co., Ohio, Oct. 8, 1815. 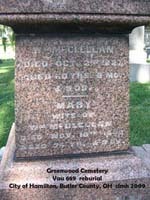 Her father was a great-uncle of General George B. McClellan. They have six children. Joseph C. was born December 14, 1843; E. Jennie, August 4, 1847; James E., August 29, 1850; Stephen O, January 29, 1853; Edward W., August 14, 1855; and Rosalinda, December 6, 1858. Joseph C , who is married to Lizzie Gerwig, now lives in Cincinnati, and is a dentist in good practice; E. Jennie is married to Samuel B. Dean, and lives at Collinsville; James is married to Ollie Cutler, and lives at Port Union; Stephen is married to Jennie Easton; Edward W. is married to Mollie HoAvard; Rosalinda was married September 28, 1881, to George Milton Roudebush, of Newtonville, Clermont County.